As the hearing in the two writ petitions seeking independent probe in the death of CBI Special Judge Loya resumed before the Supreme Court bench of Chief Justice Dipak Misra, Justice D. Y. Chandrachud and Justice A. M. Khanwilkar on Friday, Senior Counsel Indira Jaising advanced submissions on an intervention application. “There are two sets of submissions, one, on the basis of law, and the other, on the basis of facts. The former are primarily regarding the contravention of the provisions of section 174 of the Cr. P. C.”, she stated. “The ‘Accidental Death Summary’ of PS Sitabardi triggered the application of section 174. There are repeated references to section 174 in the Accidental Death Intimation recorded at PS Sadar at 4 PM on December 1, 2014. But the Intimation to the Sub Divisional Magistrate was sent only on February 2, 2016, why not on December 1, 2014? Even in that Intimation, the term ‘Accidental Death Summary’ has been used and not ‘investigation’ or ‘inquiry’”, she continued. “December 1, 2014 only has been mentioned as the date of death. It is only because of the way of writing that ‘1’ is appearing as ‘7’”, retorted Senior Counsel Mukul Rohatgi, appearing for the state of Maharashtra. “It is a suspicious circumstance that tJudge Brijgopal Loya’s name has been wrongly recorded as “Brijmohan Loya” in all medical documents including the Post-Mortem Report despite the presence of 4 judicial officers (Judge Shrikant Kulkarni, Judge S.M. Modak, Judge Vijay C. Barde and Judge R.R. Rathi) and several High Court judges (Chief Justice Mohit Shah, Justice Gawai, Justice Shukre and Justice Bora)”, she reiterated the argument earlier advanced by Senior Counsels Dushyant Dave and V. Giri. “Finally, the case diary has not been furnished. It is important to know the time at which the police station received a call that an accidental death has ensued. The diary would also provide a minute by minute account of the happenings so that Your Lordships can decide if these documents have been generated contemporaneously or later”, she continued. When Justice Chandrachud referred to a statement on record to the effect that an ECG was carried out at the Dande Hospital, Ms. Jaising advanced that the statement is “most likely false” as the ECG report has not been furnished, the person making the statement is not an eye witness to the fact of the ECG and that it is contravention of the statement of judge Rupesh Rathi, which she regarded as the “most credible statement”. “Judge Loya’s sister has stated that family history, habits of smoking, tobacco consumption and drinking, a condition of obesity etc are regarded as factors leading to a heart attack by cardiologists, but none of these were applicable to her brother. He was only 48 years old. Their parents were over 80 years old, alive and healthy. He did not even have a sedentary lifestyle and routinely indulged in sports”, she continued. “When there is doubt regarding the cause of death, it is for the Investigating Officer to decide whether to pursue the procedure under section 174 of the Cr. P. C. or to register a FIR. In this case, neither was done. This is my submission”, advanced Ms. Jaising. “Statements of Loya’s wife, sister, father and son that there is nothing suspicious as to the death have been procured under duress and are self-serving statements which should be ignored in view of their earlier statements. The sister is a credible witness as all her statements have been corroborated. R. Rathi has backed the claim regarding climbing of stairs; Justice Gawai in his interview to the Indian Express has said that a car had broken down, supporting Loya’s sister’s statement that he had reached the hospital unaccompanied”, she continued. “In 2015, judge Loya’s son, Anuj Loya, has made a statement that if something was to happened to him or any of his family members, the Bombay High Court Chief Justice Mohit Shah and the others involved in the conspiracy shall be responsible. And then in 2017, he has said before the Commissioner of State Intelligence that no inquiry into the death is sought?”, she said towards the conclusion of her arguments. “An investigation is needed because this has become a matter of public importance and also because the public agencies have not done their duty”, she iterated. At this point, Mr. Rohatgi intervened, “I was just reading the submission regarding the interview in the Indian Express. It only says that the car had brushed against another car”. 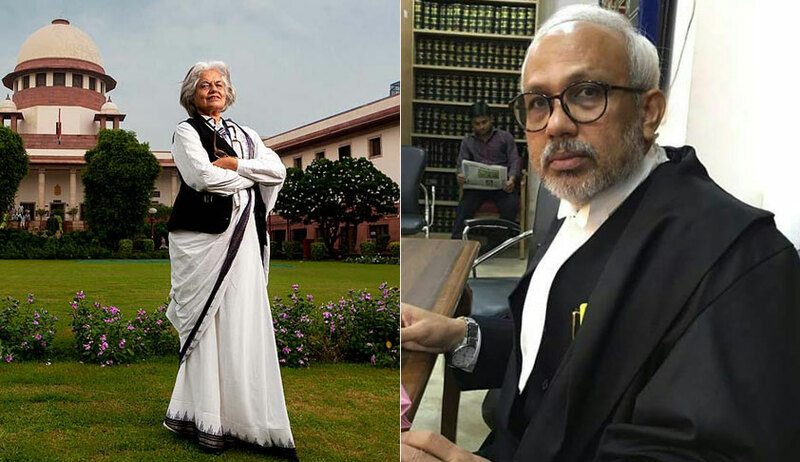 “I am only creating the grounds for investigation, not proving the case beyond reasonable doubt which would be the task of the investigator”, Ms. Jaising replied. “Finally, there is the letter by a retired judge of the Bombay High Court addressed to the Chief Justice of the High Court in November, 2017 for a SIT probe into the death of judge Loya”, advanced Ms. Jaising. “Ms. Jaising is seeking an investigation but she has not done any homework. She is talking about the transfer of judge Utpat, the Sohrabuddin trial, the story in the Caravan? Why is the letter of the retired Bombay High Court judge being relied upon? It was written after the story in the Caravan was published. Is this a PIL?”, exclaimed Mr. Rohatgi. “Are you trying to say I have a motive? Fine”, retorted Ms. Jaising, concluding her submissions. Thereupon, Senior Counsel P. V. Surendranath, appearing on behalf of intervenor All India Lawyers’ Union, pressed the prayer for a direction under Article 142 of the Constitution in respect of the security arrangements of judicial officers as well as guidelines for the independence of the judiciary from the executive. Mr. Mukul Rohatgi shall make arguments on behalf of the state of Maharashtra on Monday.